I have already posted here and here about the wallpaper stripping at Auchenard. It was pretty standard in the first two rooms. But then we meet a gold and navy room! I am wondering if this is original coloured plaster or a paint effect that has held up pretty well under the wallpaper. Welcome to the in-progress master guest room. Note the framed areas It makes me think that this was the original colour scheme and the framing was for effect. Fabulous colours and its obviously an early paint effect. Oh how I wish I could have seen it in its heyday. Downtown Abbey wouldn’t be in it! I have to say that this is a strong blue, after all those years of being hidden by the woodchip. 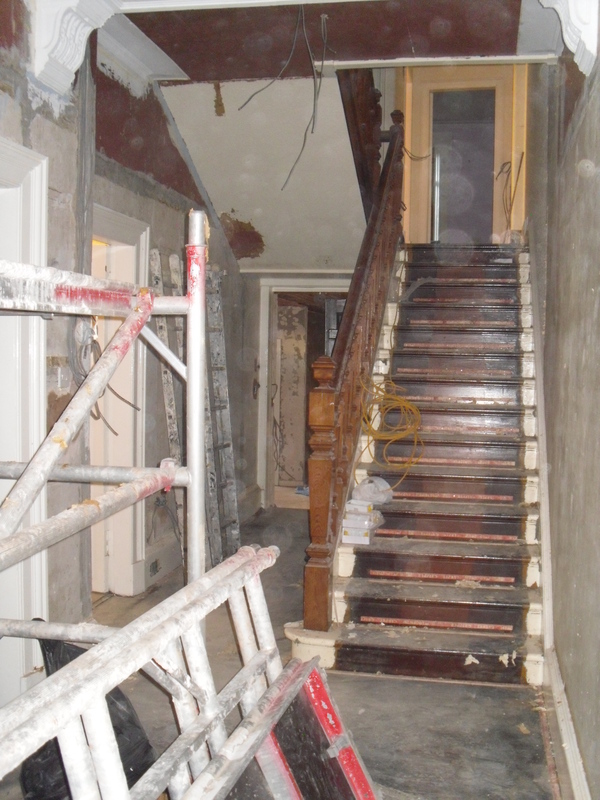 It is great to see that the plaster is in decent condition. 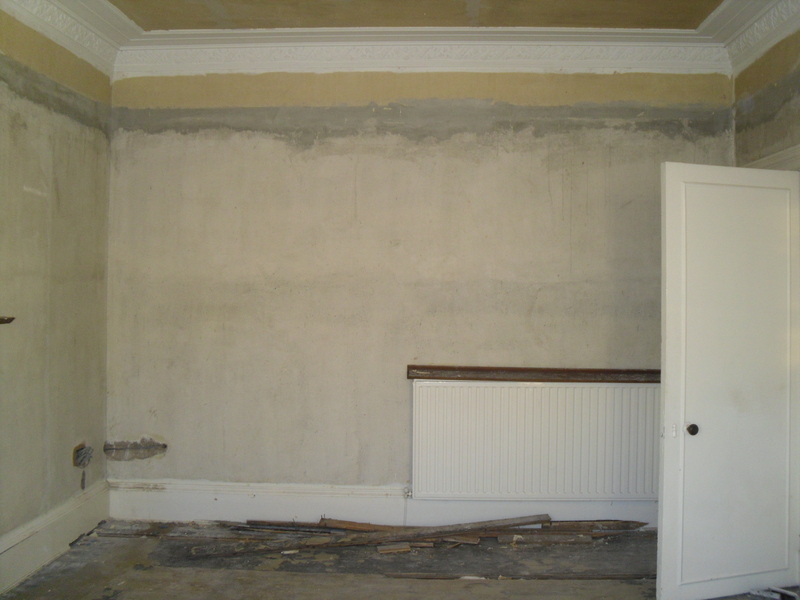 It will make the work for the plasterers smooth sailing and we should have beautifully painted walls. 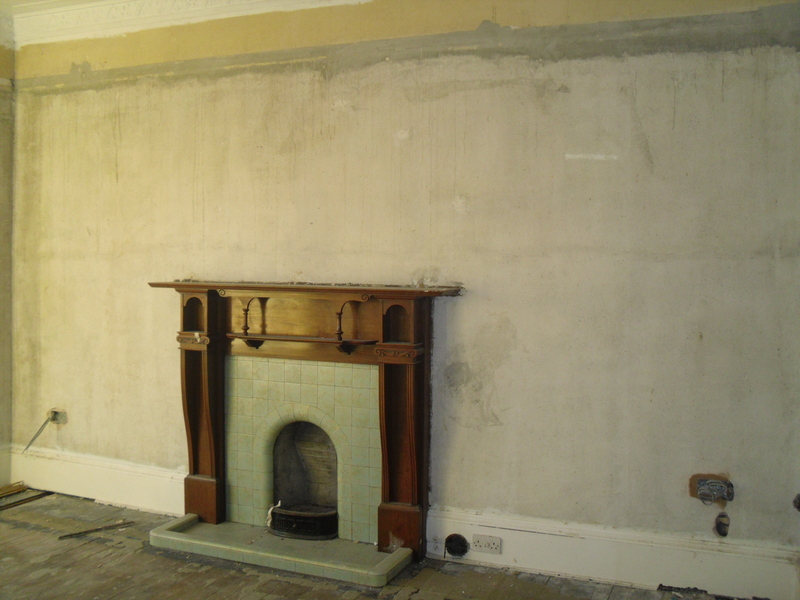 It is also a great blank canvas for us to test paint colours to match the fireplace. Doesn’t it make the cornicing stand out? It has taken some work to get to this point but it is fantastic to see the progress. When everything has been stripped away it means we get to soon start adding in our own layers. This is the dressing room adjacent to the master bedroom. This is the brown plaster in the hallway. It looks more like old glue – which it might indeed be. These discoveries are really making me want to do some research on old paint methods. To match the brown plaster we also have deep red ceilings. Excuse the dust spots, but this gives a good idea of the colours in the hall. So from light to dark – and all shades in between. It is fun to travel through all the decorating choices through the years. I wonder what else the house has to recover.